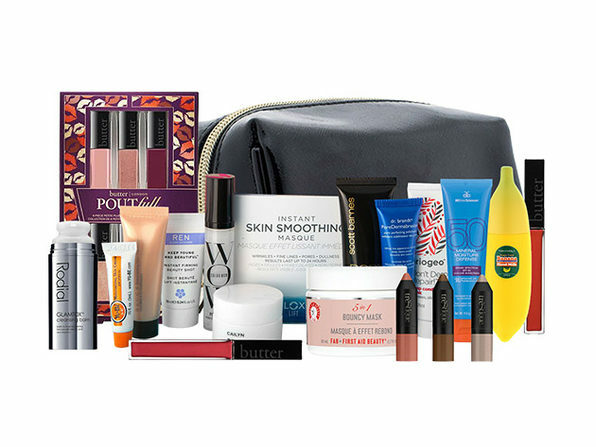 We Made a List & Checked It Twice — Win 10 of Our Favorite Beauty Stocking Stuffers! There's nothing sweeter than unwrapping a stocking full of beauty gifts you've been eyeing — and now you don't have to rely on Santa to know what's trending. We're packing up 10 of our favorite stocking stuffers and giving them away to one lucky winner! Don't worry — all these finds are currently available to shop, so you can pick a few up for the lucky beauty-enthusiasts on your list. The above brands are not affiliated with this contest. This promotion is in no way sponsored, endorsed or administered by, or associated with, Facebook. You are providing your information to StackCommerce, Inc. and not to Facebook. 1. Eligibility. Subject to the additional restrictions below, the StackCommerce Essential Stocking Stuffers Giveaway Sweepstakes (“Sweepstakes”) is open to all legal residents of the United States who are eighteen (18) years of age or older as of the date of entry. For purposes of these Official Rules, all times are Pacific Standard Time (PST). Employees or agents of StackCommerce, Inc. (“StackCommerce”) and co-sponsors of the Sweepstakes (if any) and their respective affiliates, subsidiaries, advertising/promotional agencies, and the members of their immediate families (i.e. parents, children, siblings or spouse) or those persons living in the same household of such individuals are ineligible to enter or win. The Sweepstakes is subject to all applicable federal, state and local laws and regulations. Void where prohibited by law. Participation constitutes entrant’s full and unconditional agreement to these Official Rules, any terms that apply to your use of Facebook’s policies and procedures (to the extent you seek Additional Entry per below) and any other terms that apply to your use of Facebook and Sponsor’s decisions, which are final and binding in all matters related to the Sweepstakes. Winning a prize is contingent upon fulfilling the eligibility requirements set forth above and below. 3. Sweepstakes Term. The Sweepstakes will end at 12:29 PM PST on 01/05/19 (the “Sweepstakes Term”). Sponsor’s computer is the official time keeping device for the Sweepstakes. 14. Winner List. For a copy of the name of the winner(s), available after 12:29 PM PST on 01/05/19 + 1 month, 2018, or a copy of these Official Rules, send a self-addressed, stamped envelope to, StackCommerce, Inc., Attn: “Winner List/Official Rules” for Essential Stocking Stuffers Giveaway 21 Market Street, Los Angeles, California 90291.